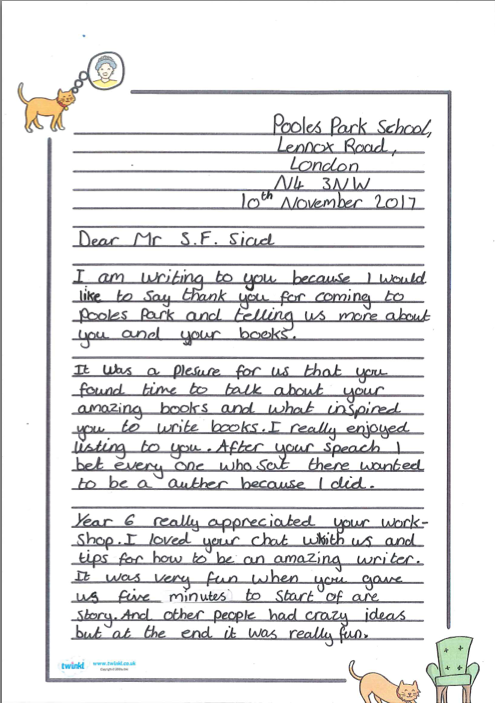 I'd like to say a very big THANK YOU to Fiona Gunn-Stokes and all the great young readers and writers I met at Pooles Park Primary when I visited them last month! First, I did a big assembly with Years 6, 5, 4 and 3 about reading and books. Then I did a creative writing workshop with Year 6, in which they produced some absolutely fantastic stories! And finally, I had the pleasure of signing a book for everyone who wanted one at the end of the day. It was hugely inspiring for me as an author to see so much enthusiasm for books in this school. 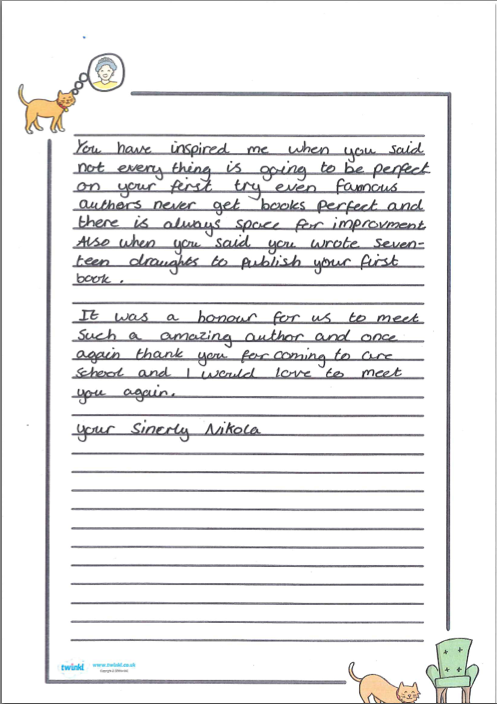 Before the assembly, I was shown the school library by two Year 6s, who pointed out all the books they'd read, and the ones they wanted to read next; and after the visit, I was very moved to receive some lovely letters. So thanks to everyone again – and if anyone from Pooles Park would like to ask another question, or say anything about about the visit or my books, just leave me a comment below! Hello Mr SF Said, Did you enjoy your visit to Pooles Park primary school? Was there anything you enjoyed seeing? I hope that you liked visiting our school.Did you like the visit? 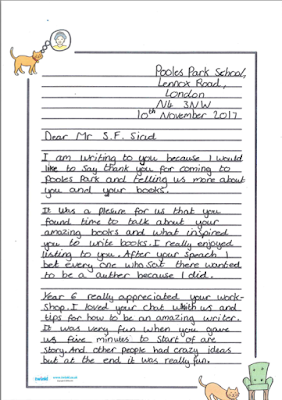 Dear Mr Sf Said, I would like to say that a big thank you for coming to Pooles Park Primary school. How did you cope with haters saying that you would never succeed, what do you do? How do you never get board of writing a book that is over a 150 pages long? were all rejecting your books? I really loved the book varjak paw. I'm also enjoying the book outlaw varjak paw. How did you cope with all the negative feedback and people that rejected your work? How were you able to cope with redoing your work 90 times? hello mr sf said.I have a question. how long does it take you to write books? I hope you answer the question. I'm from pooles park primary school and when you visited our school I wasn't there,but there's alot of photos around the school so I know what happend ok I hope you read my comment. what inspired you to write about Sally bones Holly Tam Razor and Lugar. because I really enjoy reading about how he manages to constantly escape from the dark grasp of Sally Bones and we would like to find out more about what happens next to him.I hope that you will get my comment. It's been a pleasure, thank you for taking your time to come to our school.Thank you for giving advise. Hi SF Said ,thank you for coming to our school at pooles park. It's been a pleasure to have you here. Thanks for coming to our school. We had a lovely time with you.I would like to ask you some questions. How did you feel when you're first book was published? Do you like being an author? i am happy that you came i couldn't stop writing at the work shop it was very fun. Thank you - I enjoyed my visit to Pooles Park very much! I really enjoyed meeting everyone at Pooles Park - and especially visiting your fantastic school library! Thank you - I enjoyed visiting your school very much - I hope you all enjoyed it too! dare sf said we thank you for coming to are school we love you viziting my favrert book is varjack par and out law vajack par. Thank you very much! I think if you really want to do something, then you have to persevere and keep trying to improve, no matter what anyone else says. Sometimes it can help to motivate you, just to prove them wrong! Thank you very much, I'm really glad you're enjoying The Outlaw Varjak Paw as well! Looking back, I think those publishers were right to reject my first two books, because I had only done one draft of each of them. I hadn't yet done all the work you have to do to make a book as good as it can be. Varjak Paw was the first time I did all that work, and so that was the first one that was good enough to be published. Thank you very much for your comment! I really like Razor as a character too - I think he's the one who changes most across the two books. As I said when I visited, I was inspired to write Varjak Paw after watching my own cat climb the garden wall. And here's a blog I made about all the inspirations behind Phoenix - I hope you enjoy it! Thank you so much - that's an amazing thing to hear, and really means a lot to me. And I'm so glad you enjoyed Watership Down too! I think rejections are always hard to take, but sometimes they can spur you on to improve your work. I think the most important thing is to keep trying to get better, any way you can. So keep writing, keep editing your work, and keep reading other people's books, because those are the best ways to improve. To the person who wasn't there when I visited - thank you for your comment! Varjak Paw took me 5 years to write, The Outlaw Varjak Paw took 3 years, and Phoenix took 7 years. And if you want to know why each book took so long - this blog post might help to explain it! I think each character is different, and has different inspirations, but with all of them, I was trying to make the characters as interesting and distinctive and memorable as I could. I hope you liked them! Thank you very much - and good luck with all your dreams and ambitions! Thank you so much - it was a pleasure to visit your school and to meet you all! I thought Year 6 wrote some amazing stories while I was there, so keep writing, and keep reading! Thank you - that's very kind indeed. It was a pleasure to visit Pooles Park! I think if 90 rejections didn't put me off, I would probably have keep writing anyway, even if I never got a book published! I think I would have kept trying to improve, just because I love stories so much. If you're writing a story you really want to read, then you will do everything you can to make it as good as it can be. So I would have still been a writer - just an unpublished writer! Thank you so much! I was very happy when my first book was published. But then I realised that I was going to have to write another book, and another one after that! So in a way, the work never stops, and it never gets easier. But it's always worth it in the end, because I'm writing books I really want to read myself, and trying to make them as good as I possibly can. And when they're finished, they really are as good as I can make them, and that's a rewarding thing to feel about your work. 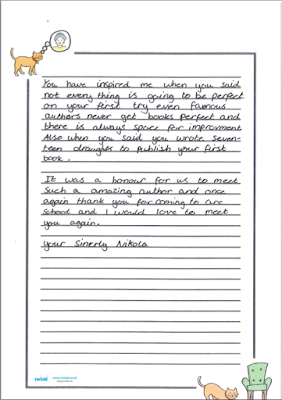 So being an author is harder than I ever thought it would be - but it's also more rewarding, especially when I hear from readers that they've enjoyed my books!